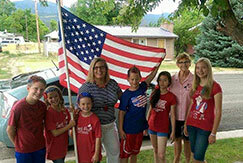 Students who decide to participate in our HomeStay program have the unique opportunity to live with American families in the Cedar City area. All families pass a background check and the HomeStay is a positive and safe alternative to staying in a Southern Utah University dormitory or local hotel. Among other positive aspects of the HomeStay program, students will learn more about American culture, feel apart of an American family, and expand their English skills. 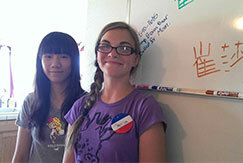 Students in HomeStay will get a great cultural experience if they choose the HomeStay option. The HomeStay experience is a fun and positive way to learn about how families in Utah live, interact, and behave. Students will eat with their families, participate in activities in the evening and on the weekends, and gain a deeper understanding of American culture through their interactions and participation. 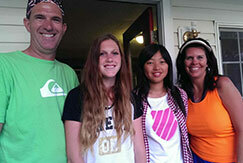 The HomeStay experiences allow students to feel and become apart of an American family. Relationships built through the HomeStay program last a lifetime and by staying with a host family, students will learn more about what it’s like to be apart of an American family. Students will eat together, cook together, take local excursions, and interact with each other on a daily basis while they are in the U.S.
Students will be able to immediately apply their new language skills with members of their host families. As students interact with their family members, their conversation skills and English vocabulary will expand immediately. Students will also learn English that may not be taught in the classroom, which is an educational bonus. Access to a kitchen, laundry room, internet – all the comforts of home. Immersive cultural exposure – experience how people really live in the U.S.
Just fill out the HomeStay student application. When it has been processed, we will contact you. For those already in the program, you can make your payment here.